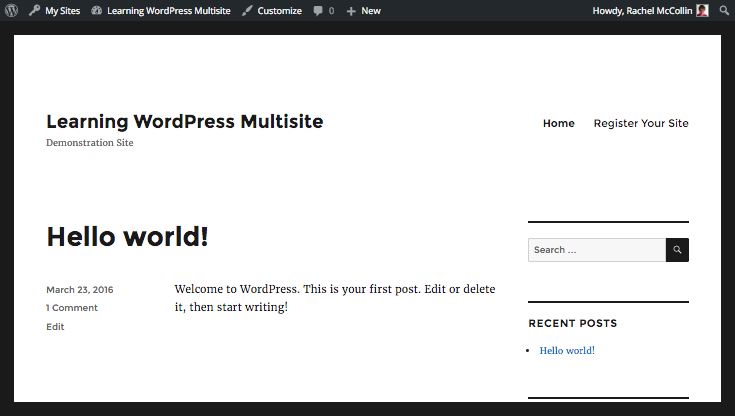 One of the great features of WordPress Multisite is the way you can let users create their own sites, either for free or with payment. Allowing users to register on your network and create their own site is very straightforward – all you need to do is enable it in your network settings – but you can improve on the process and the user experience. 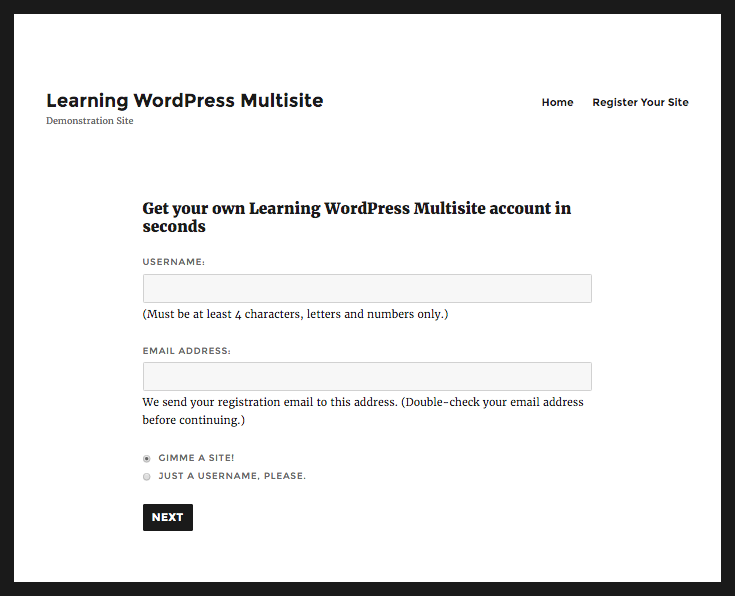 This is the third post in our six-part WordPress Multisite masterclass series. In this series, you’ll learn everything you need to know to create your own network, add sites to it or let users add their own, and manage the network. You’ll learn how to ensure your network is secure and high performing and how to create a successful community of users and sites. In this tutorial, you’ll learn how to set up site registration, then we’ll go through how users can create their own site. We’ll also explore how you can make the screens and the process smoother, and customize the signup messages. 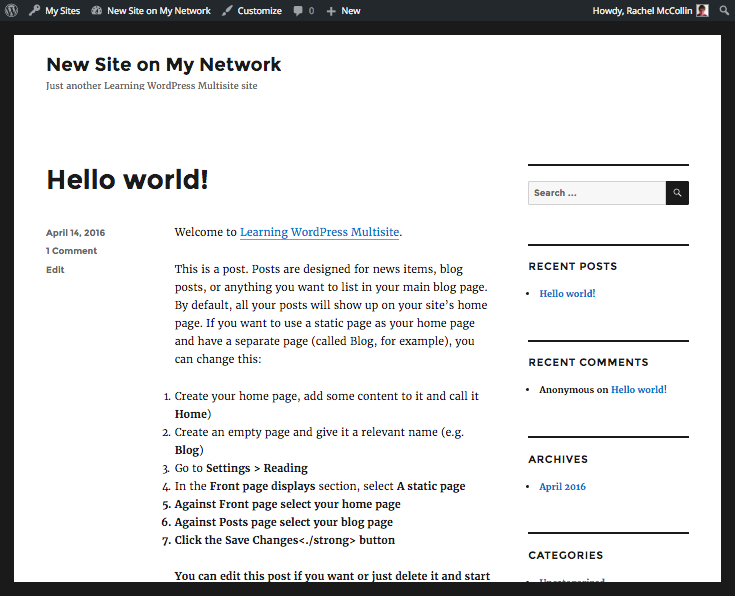 Then we’ll look at how to make site creation easier using a plugin. 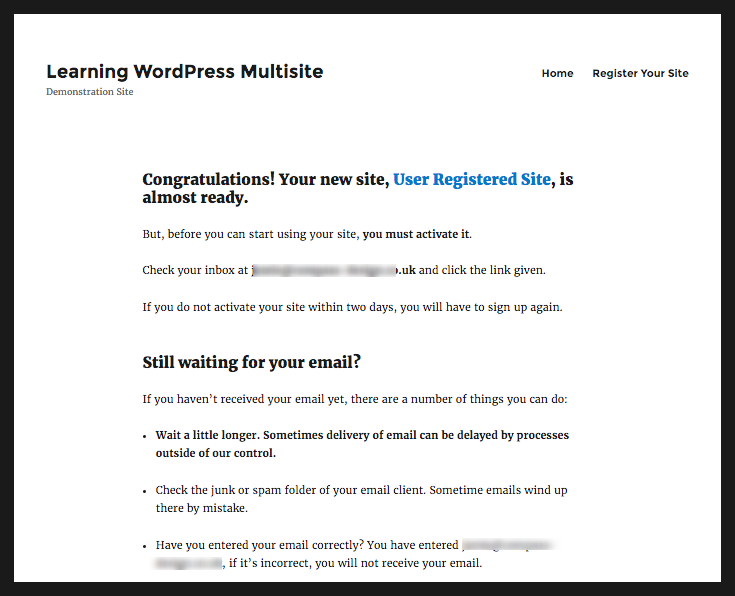 Before you start on this part of the course, however, I recommend the previous tutorial in this series, WordPress Multisite Masterclass: Activation and Configuration, which provides a solid ground in the Multisite installation process, how to create sites on your network, add users, install themes and plugins, and configure your network settings. When you’re ready, let’s start with the basics – enabling site registration. 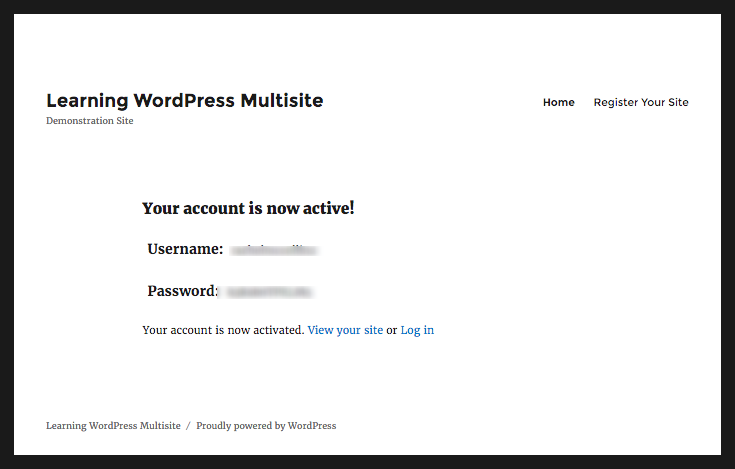 Site registration is a feature of Multisite that’s already part of WordPress, so all you need to do to allow it is to make sure it’s enabled. You can do this in the network settings screens. The second section on this screen is Registration Settings. By default, user and site registration are switched off – you need to change this. Select the option that works best for your site. 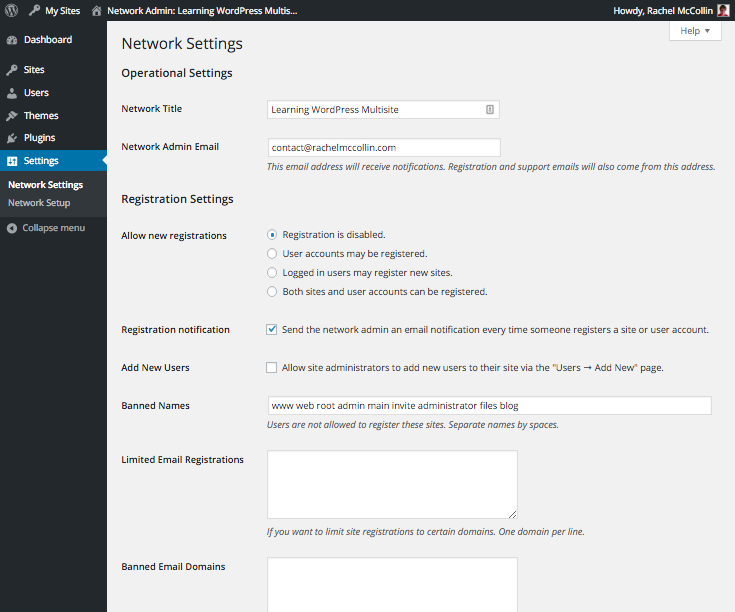 Registration is disabled: Only network admins or site admins can create new users. Only network admins can create new sites (i.e. site registration by users is switched off). User accounts may be registered: People can create a user account on your network but they can’t create a new site (similar to user registration on a standalone site). Logged in users may register new sites: Only people with accounts who are logged in can create a site. Use this if you don’t want people to create their own user accounts and sites, but just want to restrict site creation to users you set up. This is useful for a closed system such as a network of sites for a community group or business. Both sites and user accounts can be registered: People can create a site and a user account at the same time (or can create a site using their existing user account). In this part of the course, we’re going to let people create their own user accounts and sites, so select the fourth option, Both sites and user accounts can be registered. 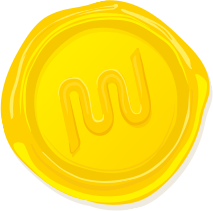 Registration notification: keep this checked if you want to be notified every time someone sets up a new site or user account. For a new network, it’s a good idea to do this as it helps you spot spammers or sploggers (people creating spammy blogs). As your network grows you may find it a nuisance to be getting emails all the time, in which case you’ll need to use an anti-splog plugin. We’ll look at those in more detail in the sixth tutorial in this course, which is all about managing your network. Add new users: If your network is a public one, or you want to give your site admins freedom to add their own users, you should check this. But if you want more control over the creation of user accounts, leave it unchecked. I like to let my site admins create new users for their sites, so I recommend you to check this. Banned names: WordPress adds some banned blog names for you by default but you can add your own. These will equate to the slug for each new site. If you want to add more, type them in here with a space between each. You may want to include your own brand name and any slugs for pages you’ve already created on your site. Limited email registrations: If your network is for an organization where everyone has the same domain for their email, you can use this to stop anyone without a relevant email address setting up a site. Type in the domain name without the @. So if your domain name is microsoft.com (for example), typing microsoft.com here will limit site registrations just to people whose email address takes the form [email protected]. Banned email domains: Use this to list those email domains you don’t want to receive registrations from. This means that if you added microsoft.com here, no-one with an email address in the form [email protected] would be allowed to create a site or user account. This can be useful if you spot lots of spammy signups coming from one domain name. Once you’ve amended the settings to enable site registration and added any limited or banned names or email domains, scroll down and click the Save Changes button. The rest of this screen relates to customizing the signup process, which I’ll come to after we’ve looked at how users create a site. 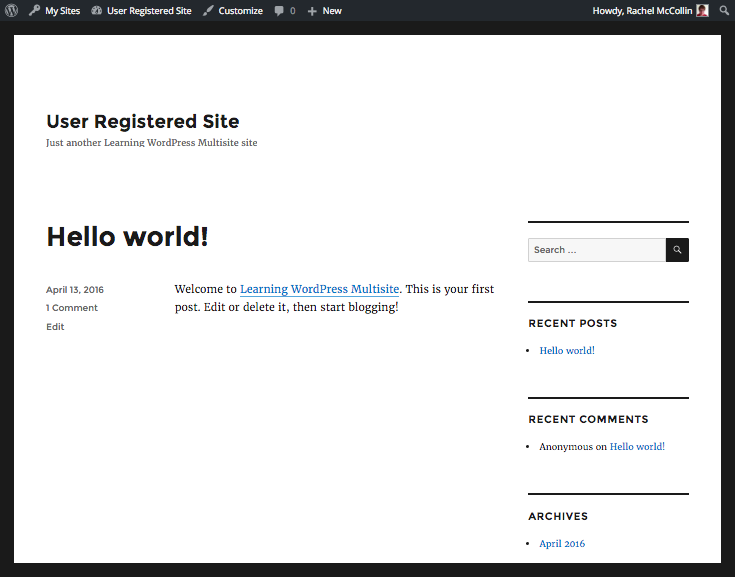 Once you’ve enabled site registration, users can do this by visiting the wp-signup.php page on your site. So if your site is at http://mynetwork.com, they’d visit http://mynetwork.com/wp-signup.php. Now, I don’t know about you, but I don’t expect users to know that without being told! So the next thing you need to do is add some form of navigation to the signup page. Use a widget for signup (which we’ll come to in a bit). Depending on your needs and those of your users, it’s a good idea to use more than one of these techniques. But for the sake of simplicity, let’s start by adding a navigation link. You do this via the Menus admin screen or the Customizer in the main site on your network. Let’s use the Customizer. Select the Menus tab on the left. Select your main menu or if your site doesn’t already have a menu, create one by clicking the Add a menu button. As you’re the network admin, you’ll see a message at the top, which other users won’t see. You’ll also see a notification of other sites you’re a member of, and some information on the process. Both of these must be unique, so if someone with that username or email address is already registered on your network they will need to log in and create a new site for themselves. Note: Once they’ve filled these out, they can choose to register a site or a user account. If they register a site they’ll also have a new user account – they don’t have to do the two separately. Here, they need to provide a slug for their site, which will be auto-populated with their username, and also provide a site title. They also need to specify whether or not they want the site to be indexed by search engines. I’m going to change the slug and add a site title, and disable indexing as this is a new site, which I’m not ready for people to see yet. Don’t forget that site admins can change this in their site settings when they’re ready, by going to Settings > Reading. Finally, click Signup to create the site. Note: If it looks like nothing’s happening at first, be patient. If you click that Signup button twice you’ll get an error message. Let’s start by customizing the welcome email messages, for new sites and new users. LOGINLINK: A link for the user to log in to the network or the site they’ve been added to by a site admin. Once you’ve edited these emails, click the Save Changes button at the bottom of your screen to save your edits. 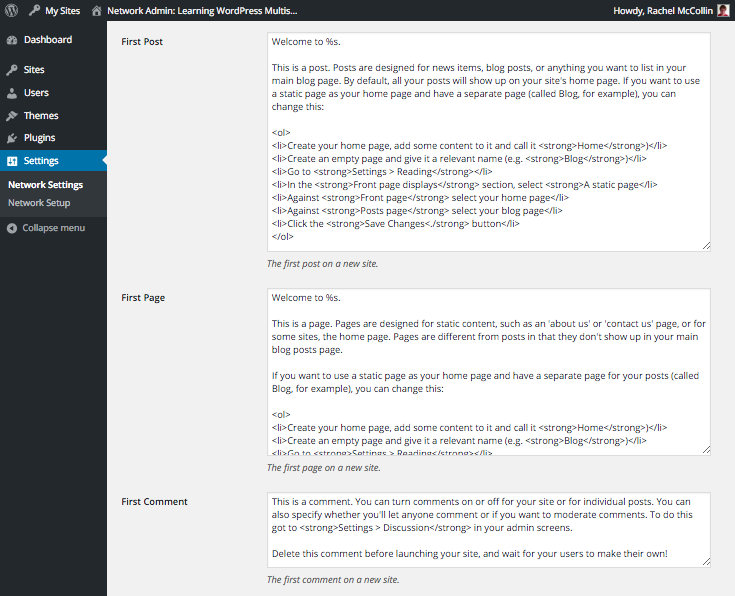 By default, WordPress populates each new site in your network with a single post, page, and comment, in the same way as it does for standalone installations. You can change the contents of these. Personally, I don’t think the content is all that helpful, so I like to do that. To do this, go to Network Admin > Settings, scroll down to the New Site Settings section and skip to the fields after the two email fields we’ve just been working with. 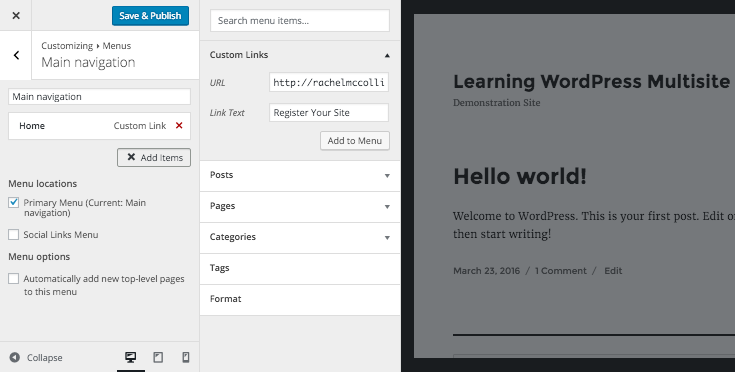 You can use HTML in these fields to add bullet points, links, images and more – get creative! Use a signup plugin (here’s a list of 20 top login and registration plugins) to add a signup widget to a widget area in your site such as the sidebar or footer, or a widget area in the main content if your theme has one. Use a forms plugin such as Gravity Forms, which lets you create a signup/registration form that powers the signup process. To link your form to the signup process you’ll need the User Registration add-on activated. You can also use the Paypal add-on to enable payment as part of the signup process. Use a membership plugin like Pro Sites, that lets you sell sites with custom options. Let’s take a look at how you would create a custom signup form using Gravity Forms. Note: Gravity Forms is a premium plugin, and you’ll need a developer licence to use the registration add-on. If you don’t have the budget, stick with the standard WordPress signup screen. You can also add other fields such as first name, surname, and a slug for the site, which will be used during the user registration process. Very simple, as you can see! Feel free to add more embellishments to yours if you want. Once you’ve done that you’ll need to link this form to the user registration process. Go to Forms > User Registration and click the Add New button. Select the action for your form first, which is Create User. Then select the form you’ve just created from the list you’re provided with. This will display additional fields relating to the site creation process. Again, select the relevant fields from the dropdown boxes. If at this point you decide you want to tweak your form or add more fields to it that’s fine, just save what you’re doing on this screen, return to the form and then come back again to edit this. Scroll down to the Additional Options and check User Activation. This enables the user activation email and will enhance security on your network. Finally, click the Save button to save the user registration feed. Now, all you need to do is add the form to your site. Gravity Forms gives you a widget you can use in your sidebar or footer, or you can add it to your homepage. Alternatively, you could create a new page just for registration, which is an improved version on the standard wp-signup screen. I’m going to add it to my sidebar. If I wanted to, I could add that form to my homepage or another page, instead of or as well as the widget area, using the button for adding a new form which Gravity Forms gives you in the page and post editing screen. Now my users have an easy to access form which they can use to create their site. I could also install the Paypal add-on for gravity forms and require people to pay for their site if I wanted to. An alternative way to do that is to use the Pro Sites plugin, which lets you configure multiple options for paid network membership and site creation. 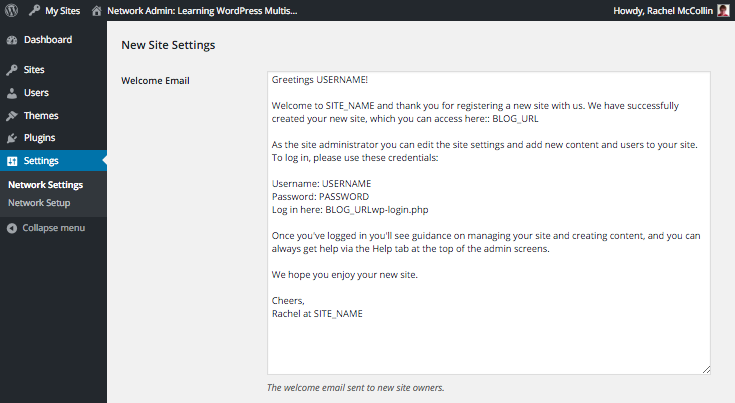 Allowing site creation by your users in WordPress Multisite is as simple as enabling it in your network settings. But, as you now know, making the process user-friendly is a bit more complicated than that. You want to encourage as many users as possible to sign up and create sites, and you can do that by giving them nice obvious links to the signup screen. You can also add a custom signup form using Gravity Forms, as I’ve demonstrated. 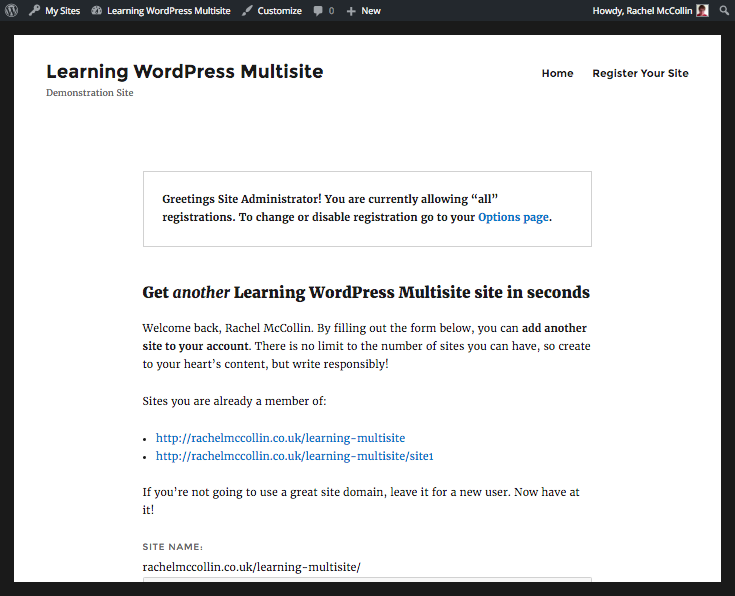 In the next tutorial in this series, we’ll look at another use for Multisite – hosting networks of personal or client sites. 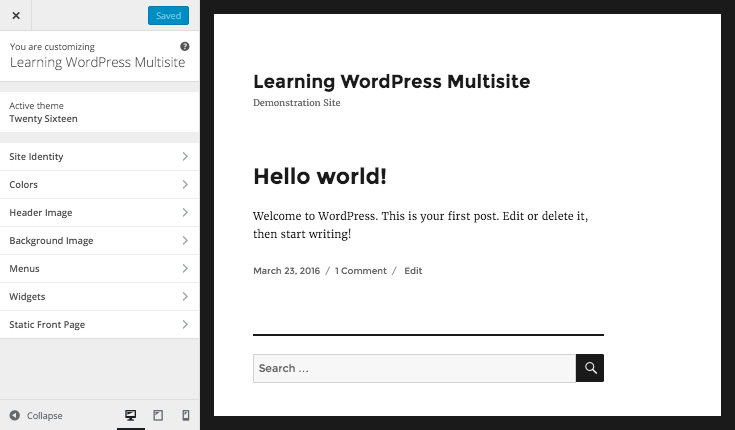 You’ll learn how to harness the power of Multisite for hosting multiple sites for your own users, and make your workflow more efficient. We’ll also look at how to use domain mapping so you can use one WordPress installation to host a multitude of sites each on its own domain. 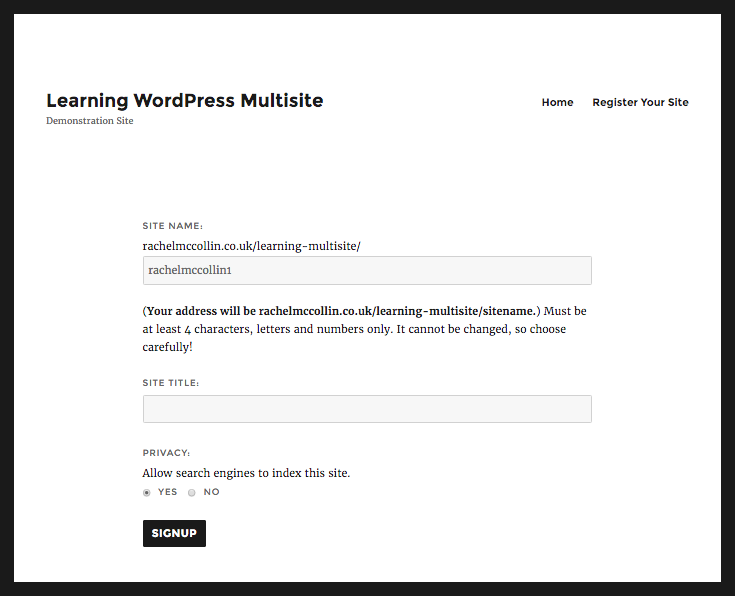 I’ve been struggling with multisite for some weeks. This post clarify a lot of important points! Thanks. So I’m not sure what I’m missing! Any help would be appreciated. I would check that your wildcard subdomains actually work. enter http://testing.yourdomain.com into your browser, it should give you a signup page. if it doesn’t then the wildcards aren’t working properly. Regarding Bluehost, if you plan on building a site like edublogs or wordpress.com, I would avoid bluehost. you’d be better off with a VPS or dedicated server for sites that large, though nothing stopping you upgrading in future to a VPS/dedicated when resources start getting used up & you have a better budget. Bluehost aren’t the best of hosts though. I ran the wildcard subdomain test as you suggested and it didn’t show a signup page! I will check with bluehost regarding that problem. For some reason, I’m not getting follow-up comments notification to my email, although I tick that option every time I comment. That’s why it’s been taking me long to see your responses! Anyway, as for hosting providers for such a project, what would your recommendations be? Good call, Bluehost should be able to give you more info about this by checking server logs. I’ll check the email notifications with our devs, thanks for letting us know about this. Pedrag and Bjorn, thanks a bunch guys! I’m wondering what’s the sign up/login form used on edublogs.org home page? I’m trying to add something like it to my home page but no luck! Any ideas anyone? 2- I need some sort of an all-in-one (login, signup, reset password) customizable widget so I can have have those 3 pages looking like the rest of my website and which I can have control over the changes (text, color, etc.). Thank you again for this course – I now have a multisite installation & am using Pro Sites for a new subscription service. Somewhere along the way in setting things up I had changed the default tagline that’s generated when someone signs up for a new site. I would like to make a change to the tagline & cannot remember where the heck I can change the default tagline. Could you please point me in the right direction?